My Creative Time: Don't Worry Be Happy! 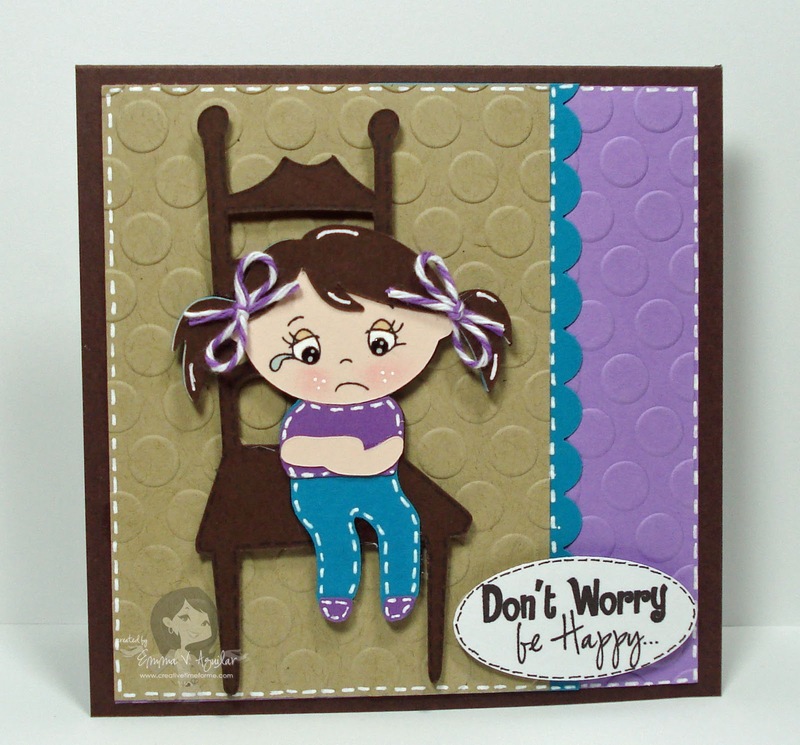 Now onto that "Oh SO CUTE" sentiment, that is from another one of my upcoming stamp releases called "I Love Your Smile"! I just KNOW this will be my "Go To" set, ESPECIALLY when I am using my ADORABLE Peachy faces! Well, that's it for today! Don't forget to see the other sneak peeks I have shown already, which you can see HERE & HERE! Emma how cute is this card! I love the PK stamps too... Thanks for sharing!!! Oh isnt this the cutest card! Loving the PKS face assorment you used. adorable!! Cute, cute, cute! I was looking at theses PKS faces yesterday. Need to wait until Christmas gets paid down. Sigh . . .
Oh she is just soo adorable. I am lovin your sneak peeks at your new stamps. Cannot wait for the release. Emma, what a sweet card! I love it! Thanks for sharing! All I can say is AWWWWWWW! She is captured so perfectly! Aww! Emma! She is just adorable!! I love this card! That PK face just makes this card. Lovin' your sneak peeks! I love the way you tied her cute pigtails! Great job! Love this card. That little girl is PRECIOUS!! The new stamps look awesome!! too funny! I think she looks like one of my girls did at age 5! Too cute! Now that is a sentiment that I need :) Can't wait to see more! WOW....this card is soooo cute. The sentiment is perfect. Looks like someone is upset because they have to take a time out.....she is so adorable. PERFECT! My mom is off to get another expression (it will be for Adrianne) so we can use this cart!!!!! LOVE IT! OMGoodness..... That is just too stinking cute!!!!! LOVE LOVE LOVE that little girl! I definately need those new PK stamps, and wish I could buy another E just for that darn cartridge, but that won't happen. :( I can't wait to see your new stamps... I am loving the ones I got from you last week!! Emma this is just adorable! That card is so adorable!!!!!!! I have been so tempted to buy the expression just to get that cart. Oh and that face and sentiment, LOVED IT!!!! Cute! I just ordered this set too. It's my first set of PKS, so I'm very excited for them to arrive in the mail. I'm hoping they get here soon so I can add a face onto the card I made for this week's Throwback Thursday project!! Oh my goodnes!!! this is so freakin cute. This turned out SO cute!!!! Emma, this card is just so precious!! She looks like she got into some big trouble! I just love your cards. Such a cute card!! That face is perfect!! I am so happy that I got that set durning the release and I just got my playtime cartrige too!! I can't wait to see your new stamps!! OMG! You make some really cute cards...I just love them! I'm new to making cards and found you on youtube. I really like that you take the time to explain how to use the gypsy because I just got mine and I'm confused. Anyway...great cards and I hope to one day be able to make them as good as yours! Oh and love the stamps! OMG this is so cute. Put a smile on my face. Sweet card for sure! Time out on this one. OMG-this is perfect for my Grandaughter, Evy. Of course at Gramma's house she does NOT need a Time-Out chair. Great card Emma. Oh My!! Way to cute!! Those faces and your stamps are way to cute for words.